Decoupled download folder size checking from rest of the informational stats to speed up the first screen refresh with current status. You now always get information as soon as it's available. 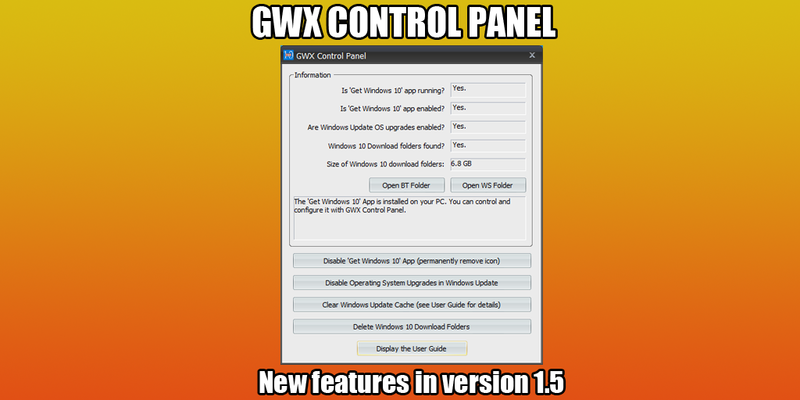 You can always download the latest version of GWX Control Panel from the Ultimate Outsider downloads page. 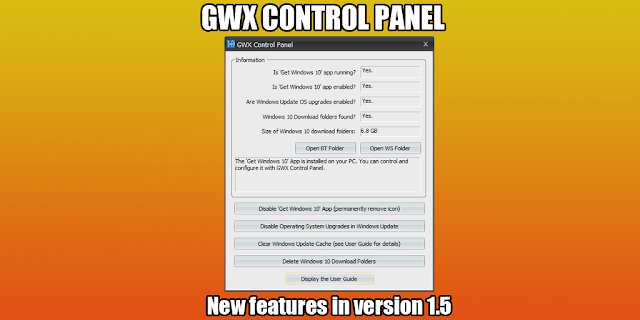 For the complete user guide and troubleshooting tips, see the original GWX Control Panel announcement. @Anon - Thanks! Several people have requested an unattended mode, and some form of that is on the roadmap. I can't give an ETA yet, but I do have something planned. There are a couple other big features ahead of that on my to-do list. All I can say is wow! I don't know exactly what GWX did to my system, but a number of problems that I'd been having for the last couple of weeks disappeared after running your Control Panel. Thanks! Tip's on the way. Ultimate Insider, can you also add an option to GWX Control Panel that completely uninstalls gwx.exe and its associated files? Most people want to be able to UNINSTALL, as well as disable, this idiotic windows 10 notification icon. Regardless, thank you so much for this program. You have done a great service to normal Windows 7 users. Thanks a lot for the program! I own a computer repair business and I've been fighting the GWX issues for weeks. Up till now I did the removal manually, changing permissions/ownership on the files and registry and then deleting the files/folders. I was skeptical about your "fix" so I ran it on a machine after finishing my manual removal and your program came back with zero results. This not only confirmed to me that my manual process works but that your program does a proper removal in a much shorter time !! GOOD WORK !! I would suggest that you keep the program simple and sweet and JUST focus on the GWX crap. Example: presenting an options to users for clearing the Windows update cache could possibly cause other issues unrelated to GWX and I'd be concerned that an average user and/or a "non-technical" person may get into trouble with features not directly related to GWX. Again, GREAT WORK on your fix !!! If your PC is on a domain, the upgrade icon will disappear and 10 will never automatically download and install. I confirmed this by taking a new 7 machine that had the icon and attaching it to a domain. The icon and upgrade to 10 disappeared from the PC. This was even before I configured the PC for WSUS. @Unknown - Thanks for your comments. While the tool originally was only intended to manage the GWX icon, it has expanded to cover more bad Windows 10-related behavior... all features are still related to Windows 10, though. The Clear Windows Update cache feature is sometimes required to clear vestiges of the Windows 10 Upgrade hijacking of the Windows Update control panel. The in-app help and the user guide make it clear that most folks won't need to do it, and that they should try disabling the other Win 10 related features before deciding to proceed with clearing the cache. There are some new features coming soon, and they still adhere to my original goal of detecting, controlling and/or eliminating Windows 10-related annoyances.